Pure Nature Familodge - Paterson Accommodation. The Little Canyon House has a 1 room with a king size bed, a lounge as well as a 2 rooms with a bunk/double bed, ensuite bathroom, huge terrace overlooking the Addo Elephant National Park a well as an open kitchen and a dining area. The Dazzie Rock House has a 1 room with a queen size bed and a lounge as well a 1 room with a bunk/double bed, ensuite bathroom, huge terrace overlooking the Addo Elephant National Park a well as an open kitchen and a dining area. 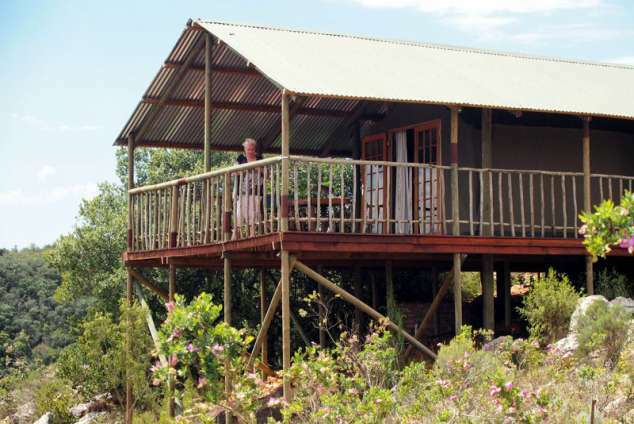 The Owl House has 1 bedroom, a lounge room, ensuite bathroom, a kitchen as well as a terrace. The owl house is situated in our petting zoo. Important: Children under 2 are free! Marie is a trained horsewright and rider. She is happy to offer pony riding and riding lessons for the children. For the unit, about 1 hour we charge R 250.00. On our hilly terrain we had a lot of natural obstacles in all heights and difficulty levels. For the experienced riders we are happy to provide a suitable horse or pony with appropriate assets. Upon request, individual lessons with the respective horse or pony can be given. Horseback riding is the easiest way to explore South Africa's nature and wildlife. Whether you are a beginner or professional rider, we have the right horse or pony for everyone. If necessary, you can get from us a trained riding instructor a few lessons. For the hour we charge R 300.00. We have a lot of hiking trails on our farm and you will get a map to explore the farm. Nature adventure for the little ones!! Treasure hunts and kid-friendly "Game Walks" children have a very special feel for the small and big "wonders of nature". We invite you to discover nature together with us! Go on a discovery tour with us. During the year you will find a variety of beautiful flowers and trees. Some of them have been used for centuries by the aborigines of South Africa as a medicine and until today you can find their ingredients in many of our medicines. Some plants you can eat or treat to delicious jam, others are just "only" for a wonderfully fragrant bouquet. Out of the garden-onto the plate! We are trying to use our own vegetables, like tomatoes, marrows, butternut, lettuce or beans fresh out of our garden. We do have a lot of chicken and so we are using our own eggs. Out of the goats milk we are producing goats cheese-it´s so nice! A variety of unique and beautiful birds can be observed at our specially designed feeding and nesting sites. Or you walk along by your own and watching birds! The best time to see birds is the early morning time! Shutter speed, aperture, ISO ....Its confusing for you? We are going to explain. We tell you where and especially HOW you shoot the perfect photo for your holiday album! We also have the option to copy your SD cards to a CD or USB stick so that you have room on your medium to take further shots of your trip. Upon request we are gladly pack a picnic basket with hot and / or cold snacks and drinks. Whether for hiking, a mountain bike tour or a donkey day hike - exercise in nature makes you hungry. You drive to the N2 towards Grahamstown. After about 58 km you arrive at Nanaga. Continue for another 24 km on the N10 towards Cradock / Cookhouse. Then you reach the city "Paterson". From the intersection, drive 5.2km to Cookhouse / Cradock. Our entrance gate is behind a curve on the left hand side. At the entrance gate you will see a steel bird as well as a sign "Bonsmara Auction"
Go for another 4km over the property of a neighbouring farm. Now you reach the Pure Nature Familodge. At our property you will see a lot of game. Please reduce the speed and keep an eye of the gate- if its really closed. 159 page views since 09 Oct, 2018.